Masaku was a descendant of the famous long distance trader known as Kivoi who was a powerful leader of the Akamba people. He was a political leader, a medicine man and a prophet. He was able to predict if his people were about to be attacked. This made him prepare his army well in order to defeat the enemy. He also predicted the coming of the Europeans and the building of the railway line. His home was near where the present Machakos town now stands. The town and the district were named after him ‘Masaku’s place’ hence, Machakos. Koitalel arap Samoei Samoei was a powerful ruler of the Nandi. When the British were building the railway to Uganda, they encountered hostility from the Nandi who attacked the railway workers in their camps and stole steel rails and copper wires. The British in turn took the Nandi’s cattle, burnt their stores and made away with their food reserves. were sent to Kenya and met with Koitalel arap Samoei. During the meeting, a fight broke out and Koitalel was killed. Meinertzhagen said that he had killed Orkoiyot Koitalel in self-defence since he had threatened his life. However, the Nandi claimed that it was the British officers who had started the trouble. Mekatilili Wa Menza was a political leader of the Giriama people. She was also a medicine woman and a prophetess. She led her people in resisting the British in 1913 when they wanted them to move out of their land in order to make way for white settlers. However, the British crushed the resistance because they had superior weapons. They then forced the Agiriama to make peace and sign treaties. However, this did not work out. In 1913, Mekatilili was arrested together with other leaders and sent to exile. Below are pictures of Mekatilili Wa Menza. Before the Europeans colonised Africa, there were two main forms of government in place. Centralized Government. A centralised system of government where a single person like a king or chief was in full control. Examples of such governments were found among the Toro, Bunyoro, Ankole and Buganda in Uganda, the Wanga in Kenya and the Chagga and Wanyamwezi in Tanzania. Council of Elders. A group of people formed a council of elders which regulated the activities of the community. Authority in this system was shared or distributed to more people within the community. There was a lot of consultation between the elders before any major decision was made. Communities like the Abagusii, Ameru, Akamba, Mijikenda and Agikuyu in Kenya had this system of government. They defended the community against attacks from their enemies. They settled disputes among community members. They punished people who committed crimes or disobeyed community laws. They administered the traditional laws. They presided over religious and traditional ceremonies like initiation, thanks giving, and child naming ceremonies. The Abawanga are one of the many communities that make up the Abaluhyia people that occupy most of the Western part of Kenya. The Wanga Kingdom was made up of several clans living together. The members of ruling clan were called Bashitsetse. 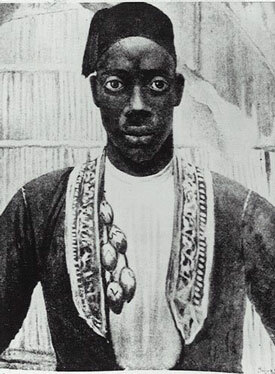 Their traditional ruler or king was called the Nabongo. The Abawanga kingdom was founded by a king called Wanga whose headquarter was at the present day Mumias. The king was advised by elders from his clan whom he appointed. The largest important expansion of the Wanga kingdom was during the rule of Nabongo Mumia. Mumia made friends with foreigners who came to the area, uncluding the British and Arabs. He was given arms by the British and Arab traders. The people in his kingdom traded with the foreigners and became wealthy. An image of Mumias and his soldiers. He ensured that his people were united and so they could not be attacked by the neighbouring communities. With the arms he received, he set up a strong army. He was wealthy; therefore he could hire people from neighbouring communities to protect his kingdom. The Ameru people are Bantu speakers who mainly live around Mt. Kenya in Eastern Province. Before the coming of the Europeans, the community was organised into villages called Mwirega. Each mwirega was headed by a leader known as Mugambi. The villages or groups of clans came together to form a larger village. This larger unit was headed by a Council of Elders. In this larger unit, different age-sets took different leadership responsibilities. Some age-sets were trained to become warriors who then had the duty of defending the community against attacks by their enemies. Here is an image of the Ameru dancers. Before the coming of Europeans, Bunyoro-Kitara was the most powerful kingdom in the present day Uganda. It had several states which included the kingdoms of Buganda, Toro, Busoga, Ankole and Karagwe as we know them today. Soon some states became unhappy with the way in which they were being ruled. They begun to break away to form separate kingdoms. Soon, the large Bunyoro-Kitara Kingdom was divided into the smaller Buganda, Busoga, Ankole, Karagwe and Toro kingdoms. When Bunyoro-Kitara finally collapsed, Buganda started becoming powerful. It had a central government headed by a hereditary king called the Kabaka. 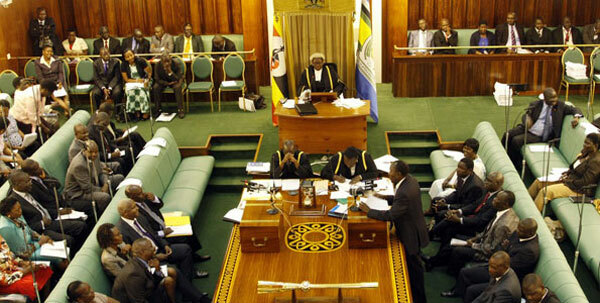 Baganda had a traditional parliament called Lukiiko. All clans were represented on the Lukiiko. It discussed matters affecting the Kabaka. It was responsible for making laws. It had a chief Justice called Omulamuzi. It had a Chief Minister or Prime Minister called Katikiro. It had a Finance Minister or Chief Treasurer called Omuwanika. The Kabaka was the Commander in Chief of the army. The Army Commander was called Muyasi while the Navy Commander was called Gabunga. The kingdom was divided into smaller units or counties called Amassaza or Ssaza (singular). These were ruled by the Ssaza Chiefs. The counties were sub-divided into subcounties Gombololas. They were ruled by the Gombolola Chiefs. The sub-counties were divided into parishes called kitongole (Plural - vitongole). They were ruled by the Batongole Chiefs. Parishes were further divided into villages called Miruka. They were ruled by the Miruka chiefs. Villages were made up of a group of clans each headed by a Bataka. He was a religious or spiritual leader. He was head of the army and led his people to war. He allocated land to members of different clans in the Kingdom. Being a spiritual leader, he offered prayers on behalf of his people. The Buganda Kingdom was started by Kintu who lived near Mt. Elgon. It is believed that the thirteen Buganda clans are made up of the descendants of the thirteen people who travelled with Kintu. At the start, Buganda was a small state which was easy to rule. It had a strong and organised army. This enabled it to conquer the neighbouring states. It had strong leaders. They had no hereditary chiefs. All chiefs were appointed by the Kabaka and they had to respect him. It had an organised system of government. It controlled the trading routes in the area, which made it wealthy and gave it access to superior weapons, from Arab traders, which Buganda's enemies did not have. They were able to hire people from other communities to fight for them whenever it was necessary. The area had a suitable climate and good soils. This ensured that the people had enough food to eat throughout the year. There was plenty of fish from Lake Victoria. This provided enough food for the people in the kingdom. Therefore they were healthy. They mined iron in the kingdom. This enabled them to make spears and arrowheads. This improved the strength of their army. The Buganda Kingdom fell when Kabaka Mutesa I invited the British missionaries into the kingdom and decided to collaborate with them. 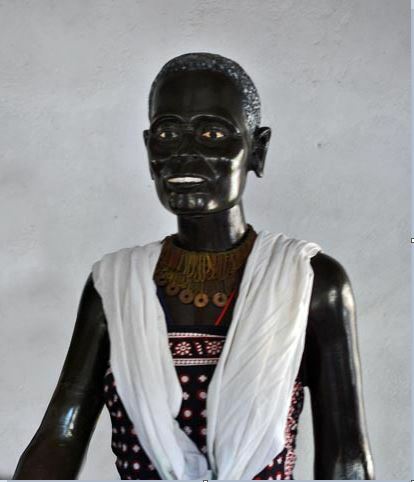 The Nyamwezi are a Bantu speaking community that lives in the Northern part of what is now Tanzania. They began to unite and became a strong in the 19th Century. They had strong leaders like Mirambo and Nyungu ya Mawe. Unity among the people was enhanced in order to protect the trade routes which they controlled. They were long distance traders who traded with Arabs at the coast. This made them very wealthy. They occupied fertile land to the south of Lake Victoria where they were able to grow enough food. Since they were close to Lake Victoria, they were able to fish in the lake. The Nyawezi lived in groups of villages called Gunguli. This was headed by a hereditary chief known as Ntemi or Mutemi. 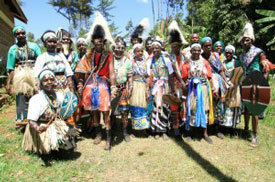 Such chiefs were also found among other communities living in the north- west and central parts of Tanzania. The Ntemi or central ruler was assisted to rule by a council of elders called Wanyamhala. The Ntemi was also a military and religious leader. In spiritual matters, he was highly respected and regarded as a priest. He was Commander-in-Chief of the army. He made political decisions on behalf of the clan. As a religious leader, he made sacrifices to the gods on behalf of the chiefdom. He was assisted by team of religious leaders called Wanyikulu. Minule - He ensured that taxes were paid. Mganwe - He carried out religious ceremonies and functions. Kikoma - He was in charge of passing on news in the chiefdom. Mtwale - He prepared the army for war. Mteko - He acted as a spy and got information about enemies. The Nyamwezi were famous in long distance trade and by the eighteenth century, the trade in the region was already well organised on the basis of clans. In the nineteenth century, Arabs begun to trade with the Nyamwezi. At about the same time, they were invaded by the Ngoni from the South. It then became necessary to reorganise their empire and protect trade routes. The two Nyamwezi leaders who were able to do this were Mirambo and Nyungu ya Mawe. Mirambo was captured by the Ngoni after they fought with the Nyamwezi. During his life in prison, he was able to learn new fighting skills and techniques from the Ngoni. After his release, he became the Chief of Uyowa Province. Mirambo was ambitious and wanted to extend his power and influence. He begun recruiting soldiers and even paying some mercenary soldiers to increase the strength of his own army. He then established his capital at Urambo which developed into a very important trading centre. Mirambo’s empire extended across the Arab caravan routes, which he was then able to control. He then imposed a tax on Arab traders to cross his territory. This tax was a very important source of income for the empire. When he died, his half-brother, Mpandasholo succeeded him but he was not very strong. The empire then split again into small units and finally collapsed. Nyungu ya Mawe was another Nyamwezi leader who tried to unite the empire. His area of control was located to the South of Mirambo’s empire. He also had a strong army and hired soldiers to increase the strength of his army. He established a central system of government in his territory. Each time he conquered a region, he put one of his men to be in charge. These rulers were known as Mutwale or Vatwale (plural). He was the central ruler and had control over the whole territory. Since the government of the empire was centralised, the Kingdom was able to survive even after the death of Nyungu ya Mawe. Different chiefdoms within the empire often fought amongst themselves. There was no clear succession plan within the empire and both the maternal and paternal relatives claimed leadership to the throne. The Ntemis were usually succeeded by the appointed officers although in some cases the throne was inherited. Continual disputes between various leaders weakened the empire and its power declined. The kingdom, however only came to an end when it was absorbed into the German East African Colony.